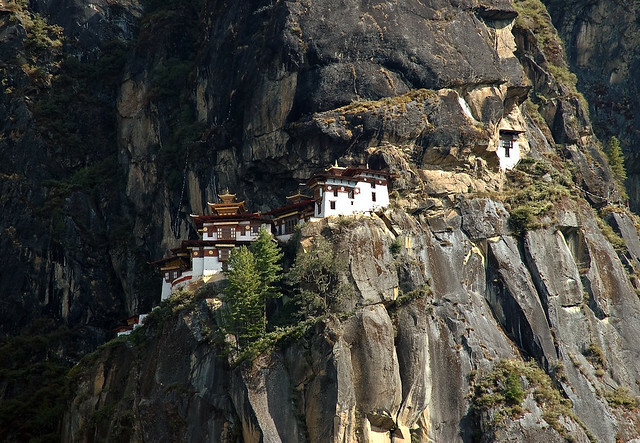 Taktsang is one of the holiest pilgrimage sites in the Buddhist world. The Guru in question is Guru Rinpoche (“Precious Master”) or Padmasambhava, an actual historical figure who was born in India in the 8th century and is credited with bringing Buddhism to Bhutan. Sangay explained that the Guru is regarded by Bhutanese to be the second Buddha. According to legend, he flew up to the cliff from Tibet on a flying Tigress and, after pacifying the local demon, meditated in a cave for 3 months. Later, a monastery was built in this holy place and hence its name: “Tiger’s Nest”. Guru Rinpoche also had miraculous powers and could subdue demons and evil spirits. The benevolent king on the sign refers to Bhutan’s much loved fourth king, Jigme Singye Wangchuck, who when crowned King of Bhutan in 1972 declared that he was more concerned with Gross National Happiness (GNH) than with the more commonly measured Gross Domestic Product (GDP). The king announced that economic growth does not necessarily lead to contentment and instead focused on the four pillars of GNH: a pristine environment, economic self-reliance, the preservation and promotion of Bhutan’s culture and good governance in the form of democracy. I do not know many places in the world where kings have forced democracy onto their reluctant people, but in 2006 Bhutan’s king abdicated in favour of his eldest and more modern son, Jigme Khesar Namgyel Wangchuck (who recently got married to his sweetheart in a 3-day ceremony) after introducing democracy to Bhutan. The 31 year-old new king, who is now a constitutional monarch, has gone on extensive tours of his country, most of which is inaccessible by road, to meet his people and learn from them. In Bhutan, the king and the government are seen to be at the service of the people. And yes, they really do look happier and more content than most places in the world that I have been to. Coming from Pakistan where, as a friend quipped, we measure Gross National Frustration more than anything else, Bhutan is a modern day Shangri-La – a mystical, serene land where the environment is protected and human life respected. I looked up at the trail that climbed through pine trees and rhododendrons and noted that not a single piece of wrapping paper or even plastic water bottle had littered our way, despite the dozens of visitors that we had encountered on our way up. I dusted off my sweater and started walking uphill. By now Sabah had gone up on her own and we decided to meet at the halfway point where a small cafe is located. Sangay, who we decided was the kindest and sweetest Bhutanese man we had met (until we discovered that like most Bhutanese, he understood Urdu/Hindi perfectly and had been privy to all our conversations! ), stayed with me and helped take pictures of the stunning landscape. The trail is wide and gentle at first – so that climbers can acclimatize to the altitude and Sangay informed me (rather late) that we could have gone up on ponies to the cafe! But from the cafe onwards, the trail becomes very steep and is even dangerous at certain points. Ponies certainly don’t go up any higher. Sangay told us how several visitors, especially foreigners, had slipped and fallen to their deaths on the trek up, so the King had decided to widen the trail and put in railings in some places to make it safer. At the halfway point, as we rested and drank water, we gazed across at the monastery clinging to an adjoining cliff, that seemed so much closer now. Just how did the builders of this monastery transport all that timber up to these heights? Legend says they were aided by “dakinis”, celestial beings who transported the building materials up the cliff on their backs. Sangay explained that the monastery was destroyed by a fire in 1998 and it took the renovation team until 2005 to reconstruct it with the help of a cable lift. The government then removed the cable once the renovation was complete. Buddhists believe that the harder your effort, the more you are purified. Later, when I reached the top and felt exhilarated by the climb, I could understand the wisdom in removing the cable. You appreciate the monastery all the more because of the arduous climb; and I don’t know whether it was due to the light-headedness that comes with the climb at this altitude but somehow I felt cleansed and lighter, as if I had shed some of my worries along the way. Although by now we were quite exhausted, we were told that the monastery was only around an hour’s trek from the mountainside, so we decided to press on. But the climbing got tougher and the trail narrower. There were brightly coloured prayer flags along the way, waving in the cool mountain breeze. Sangay explained that pilgrims brought these up and festooned them on the sacred mountain, hoping that their prayers would be answered. Henceforth, I would look at these flags and think of the prayers of all the people that they represented – somehow it was a comforting feeling to be surrounded by so many prayers. It was as if the entire mountain had been blessed by the prayers of thousands of people who come here year after year. We soon reached the cliff adjoining the monastery and from there on we had to climb down many steep steps carved into the mountain and then up again into the monastery. We all sat down for a well-deserved rest. Sabah was already talking to a monk seated inside a small, makeshift cabin. “Guess what, he wants to visit Pakistan!” she told me excitedly. So that is how we discovered that Guru Rinpoche was born in the Swat valley, in one of the sacred lakes where he had been found floating on a lotus flower at the age of 8. “You can come now to Swat, the Taliban have been chased out,” I assured the monk, who explained that 2 years ago he had been denied permission to travel to his birthplace. I offered to help him obtain an NOC and he happily wrote down my email address. “I will meditate there and I will find out which lake it is,” he told me when I warned him that there were many lakes in Swat and so many Buddhist ruins that it would take a long time to find the right one. Buoyed by discovery of Guru Rinpoche’s birth in present-day Pakistan, we pushed forward, clambering down the stairs and across the bridge that led to the monastery. There was a stunning waterfall on the way and I stopped to take more pictures. The steps up to the monastery were even more arduous; and then, all of a sudden, we were standing at the main archway! Unfortunately we had to surrender our camera, so I have no pictures of the monastery’s interior. It was larger than I had expected; the spacious interior was covered with paintings depicting Guru Rinpoche’s life. By now it was past 5pm and they had shut most of the rooms. We wandered onto the wooden balconies which afforded stunning views of the valley below and finally one of the monks opened up the main room where the deities were located. Sangay, who was wearing his elegant traditional dress called the Gho (otherwise he would have been denied entry), prostrated himself in front of a large statue of Guru Rinpoche while I stood and prayed quietly and gave thanks for the chance to visit this beautiful monastery. It was soon time for us to leave; even the monks gently suggested that it was getting late and we began our journey down after being blessed with holy water. We quickly peaked into the narrow cave where the Guru must have meditated, and off we went down the mountain. By now it had started raining and the sun was setting very fast. For me it was somehow easier going downhill and I sped down the trail, hoping to get to the forest near the bottom before it got completely dark. By now Sabah’s sugar levels were dangerously low so we stopped at the cafe, which was miraculously still open, and quickly bought some juice and biscuits to consume on the way down. There was not a soul on our climb down – by now it was almost 7pm and very dark and the trail was still quite steep. If anyone was scared, no one wanted to show it. Luckily Sangay had a torch inside his mobile phone and with that little light we climbed down and through the dark forest where, much to our relief, we heard the ding-ding-ding of the prayer wheel in perpetual motion. Buddhists believe that prayer wheels are used to accumulate good karma and to purify bad karma. We had made it back safely! I for one had been inspired and – I hope – cleansed of negativity. Bhutan had conclusively shown me that a compassionate and harmonious way of life is possible without a high GDP. Original story by Rina Saeed Khan in The Friday Times. Really love your Blog.. InshaAllah will be there one day.